In our Custom Cue Gallery you will find samples of cues representing five different levels of cues. (See Below). The grade level is based on artistic design and/or complexity. Our grading system allows the cuemaker and customer to be on the same page when describing what level cue is being discussed. These photos are being used as a courtesy of the cuemakers and may not be used by anyone else for any purpose, without the permission of the cuemaker. Below we have graded the cues to let viewers know how our rating system works. Double click on picture to visit cuemaker’s website if available. Level One: House cue conversions, break and jump cues and simple non-inlaid cues with wraps. Level Two: Basic cues with points and or very basic inlay designs. Level Three: Very nice inlaid cues that are primarily made to sell in the players mid-price range from a few hundred up to $1500. Level Four: These cues are what would be considered mid-priced collectors range and normally sell for $1500 up to $3000 and must be very nice in design and originality. Level Five: These cues are considered high-end collectors grade cues and normally sell for $3000 and up and would include exceptional design, originality and complexity of design. NOTE: Our above pricing structure is not in concrete and only shows what the average cuemaker might normally charge for cues of that level. Some members might get thousands of dollars for cues that would be considered level 2 or 3 in complexity. These pricing differences can be due to rarity, sharpness of details or the cuemakers fame. We are not addressing those price issues here, but just placing the cue in a group based on artistic design and/or complexity. It is not a quality rating! from some of the first members to join the ICA. Be sure to check out all the Gallery Pages! Here is a simple Level One cue from Cameron Cues. This is a Level Two cue from Cameron Cues. An upper-end Level Three Cameron Cue. Above is a Level Five cue presented by Jerry Powers of Jerico Cues. Above is a Level Five Cue from Que Perfect Cues. 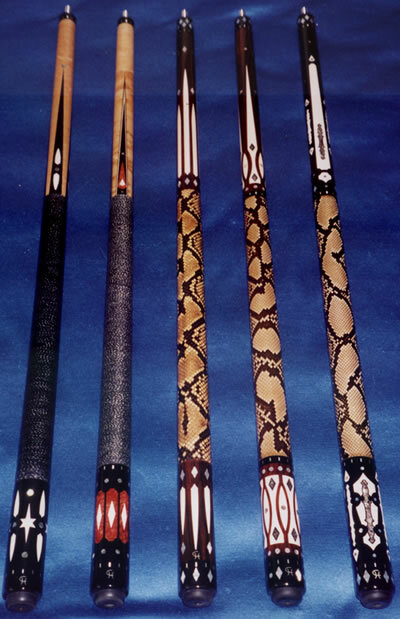 The above photo shows a group of cues presented by Chris and Israel Hightower of Hightower Custom Cues. The cue on the left would be an upper-end Level Three cue. The next two cues would be Level Four cues and the two on the right would be Level Five cues.